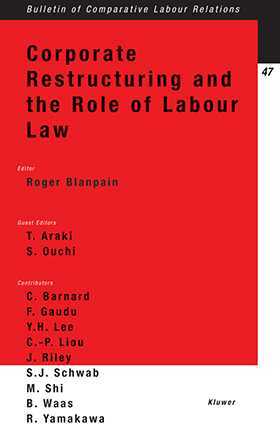 This bulletin presents a comparative analysis of the degree of worker protection available today in nine countries in the event of corporate restructuring. The countries are France, Germany, the United Kingdom, the United States, Australia, China, Japan, Korea, and Taiwan. The authors pay particular attention to the effectiveness of employee protection legislation such as the EC Transfer of Undertaking Directive (and its implementation by Member States) and Japan's Labour Contract Succession Law and, in the case of the United States, the virtual absence of such legislation. These papers were originally presented at the Sixth Tokyo Seminar (March 2002) of the Japan Institute of Labour. Their penetrating individual analysis and revealing comparative perspective is sure to help policymakers, lawyers, academics, and other specialists in industrial relations find a way forward in this important area that recognizes the best interests of both employers and employees.